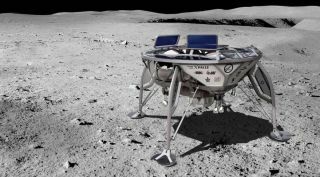 Artist's illustration of Google Lunar X Prize entrant SpaceIL's lander on the surface of the moon. The deadline was originally the end of 2012, but GLXP representatives pushed it back several times, finally to March 31 of this year. Google apparently did not want to grant another extension — but that doesn't necessarily mean the moon race is completely off.